The Arctic Race front suspension’s geometry was developed through racing. Our unique wide A-arm spacing complements the chassis design, which allows us to maintain a tighter suspension. 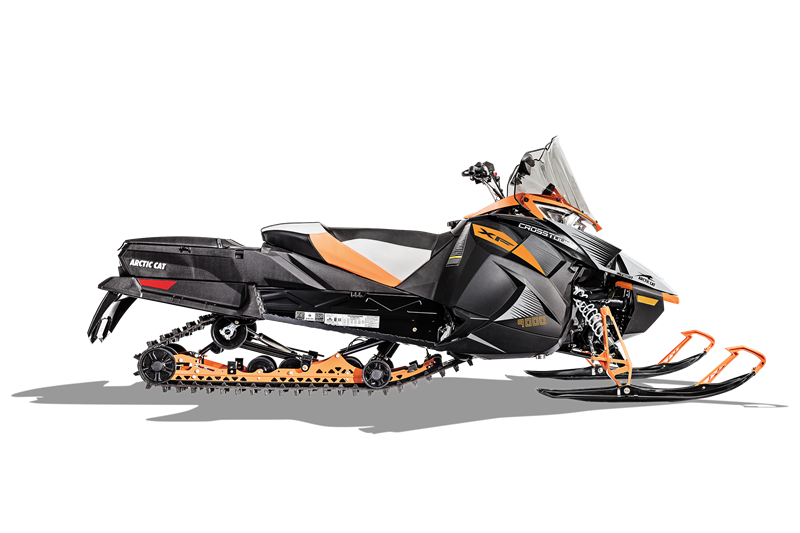 Arctic Cat gas IFP shocks feature a hard-anodized aluminum body, 0.5″ shaft, aluminum internal floating piston, and high-quality seals and ice scrapers. For added strength, the eyelet on the shaft end is forged, replacing the welded design. This dual configurable LCD screen gauge allows to you check all the vital information about your snowmobile and more. 14 different readings to be exact. There’s an odometer, speedometer, max RPM, 2 trip meters, engine hours, low oil light, coolant temperature, exhaust temperature, intake air temperature, battery voltage, fuel level, clock and reverse indicator. Not all mirrors are the same. Ours are heavy-duty, built to last and made to withstand whatever winter throws at them. Want to ride even more? This 4.3-gal. auxiliary tank is just the ticket. It has a separate fuel cap located under the cowling behind the passenger seat and feeds directly into the main 10.7-gal. fuel tank to give you 15 total gallons of fuel capacity. The 146-in. Cobra track’s cupped lug design delivers superior handling, acceleration and braking in loose snow conditions. Its traction teeth add extra grip on hard-packed surfaces. The 1.35-in. paddles provide that extra traction needed when you find yourself blazing your own path. Say goodbye to cold hands. Our hand and thumb warmers provide plenty of warmth and comfort on long rides. Ample storage for anything you need — water, snacks, gloves, you name it. It also features a belt holder that keeps your spare belt out of the way and secure. Auxiliary Gas Tank 4.3 gal.